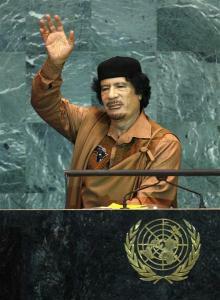 Despite the council’s own inquiry this year finding evidence of war crimes by the Qaddafi regime, the UN Human Rights Council, according to the agenda of its current session, is planning to “consider and adopt the final outcome of the review of the Libyan Arab Jamahiriya,” which lavishes praise on the disgraced regime. According to the council’s timetable, the lengthy report hailing Qaddafi’s human rights record will be presented on March 16, and then adopted by the council toward the end of the month. The report, which the UN has listed on the March session’s website, is the outcome of a 2010 session that was meant to review Libya’s human rights record. The report had been postponed repeatedly since originally scheduled for adoption last year. The report also includes praise of the old regime’s record by Qaddafi-era diplomats who changes sides and now represent the new government (click here for quotes). “With Libya’s own UN diplomats admitting that the Gaddafi regime was a gross violator of human rights, it would be nonsensical for the UN to adopt this false report,” said Neuer. Let them pass it. It just beggers belief and is more sand shifting under the foundations of the now redundant UN. Absolutely shocking. The UN really does live in a morally absurd world where dictators can do no wrong, alive or dead.